Incline Village, Nevada - Xeric Design is celebrating the 17th birthday of EarthDesk, with up to 45% savings on EarthDesk 7 upgrades and new purchases. Full versions of EarthDesk 7 start at just $17 and upgrades start at $10. This offer is valid only from the Xeric Design website through March 17, 2019. 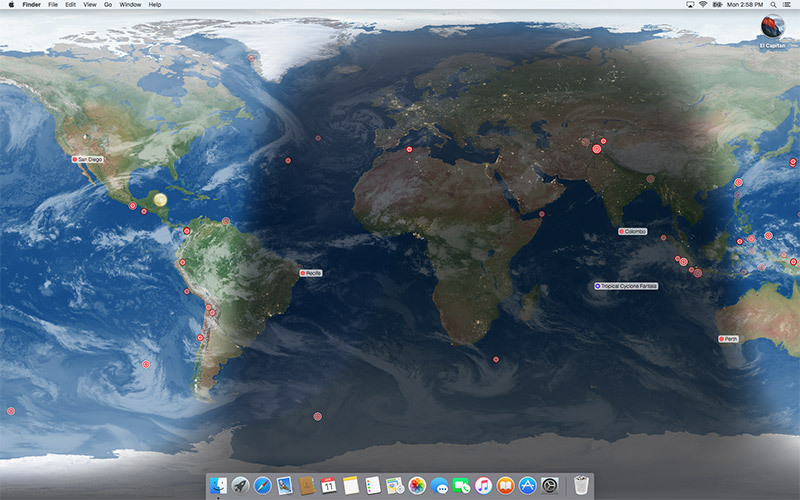 EarthDesk replaces your static desktop with an image of the Earth showing current sun, moon and city illumination, as well as real-time global cloud coverage, allowing you to track hurricanes and other weather systems on your Macintosh or Windows desktop. The software operates silently in the background, keeping your desktop updated while you work. Unlike a screen saver, which only appears when your system is idle, EarthDesk's dynamic desktop is continuously displayed as your desktop background (and optionally as a screen saver). EarthDesk 7 allows users to purchase an optional data subscription (included in the birthday sale) which offers up to 16 times as much detail in the cloud layer. In addition, this service displays real-time data including worldwide earthquakes, named storms (typhoons, hurricanes, etc.) and the position of the International Space Station. EarthDesk for Macintosh requires Mac OS X 10.10 or newer. EarthDesk for Windows requires Windows 7 or newer. Some features are platform-specific. For more information and to download an evaluation version, please visit Xeric Design online. Xeric Design, based in Incline Village, Nevada, is a leader in global time and mapping software. Its flagship product, EarthDesk, for both Macintosh and Windows, is enjoyed by users in more than 140 countries. Copyright 2019 Xeric Design. All Rights Reserved. Apple, the Apple logo and macOS are registered trademarks of Apple Inc. in the U.S. and/or other countries.